Thank You For Voting Honolulu MedSpa The Best Laser Hair Removal Again for 2018. We’re honored to have this title for 4 years straight in Hawaii! You’ll see visible results in as little as 4-6 sessions. Reduce those annoying razor bump and irritation after you shave. Greatly reduce and even eliminate the need for shaving, tweezing, and waxing. Our providers are certified and trained to use the most sophisticated lasers available. We can target coarse and dark hairs while leaving the surrounding skin undamaged. An excellent solution for removing unwanted hair from the face, leg, arm, underarm, bikini line, and virtually any area on the body. Painless: Comfortable Laser Hair Removal, Finally! Remember the phrase, no-pain, no-gain? It doesn’t have to apply to laser hair removal. Our laser hair removal options offer the right combination of care and technology to maximize your comfort and results. All laser hair removal treatments start with a free consultation, to evaluate your skin tone and hair texture. We’ll determine which of our laser options best suits your needs, and develop a personal schedule and care plan to get your skin smooth and hair free! Patient comfort is one of our top priorities, which is why we’re proud of our famous painless hair removal reputation. We’re the first provider in Hawaii to introduce Soprano® ICE, which represents the best technology on the market for easy and incredibly effective laser hair removal. * Pulses of energy gradually heat the follicles in the skin’s sub dermal layer while an additional cooling mechanism ensures that the surface of your skin stays cool and comfortable throughout your treatment. While pain tolerance is subjective, many patients describe their treatment as soothing. Yes, currently all studies show that light energy from hair removal lasers do not cause cancer. However, like most medical procedures there are some risks involved like slight discoloration around the treatment area, possible irritation near the laser session area and some redness can occur too. “Soprano® ICE takes painless hair removal to the next level. It’s faster, offers more contact cooling, and has twice as much power than previous Soprano models so our patients can enjoy shorter treatment times, a more comfortable experience, and better results than ever before. Some patients come in worried that ‘painless’ hair removal sounds too good to be true and I get the opportunity to reassure them that our laser hair removal technology really is virtually painless on the Soprano® ICE. 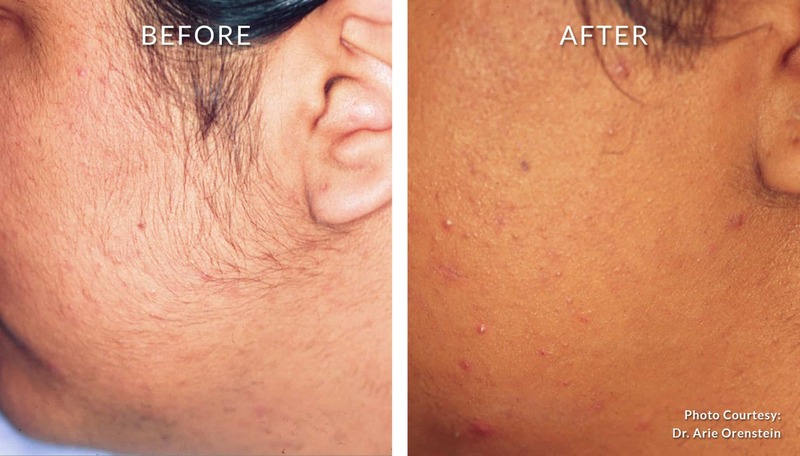 “I hear from patients all of the time who tell us that they first started laser hair removal elsewhere and found the treatments to be very painful; so painful in fact that they were afraid to go back for another treatment! The majority of these patients then found Honolulu MedSpa by conducting an internet search about ‘painless hair removal’ and found us. Once these patients come in and experience their first treatment on our advanced lasers, they won’t go back. In fact, some actually abandon their prepaid packages at other offices in favor of continuing their laser hair removal series at Honolulu MedSpa. “My experience with Honolulu MedSpa was great! I would recommend the Spa to anyone looking for a good place to get laser hair removal. The staff is friendly, the facility clean, and I love my results! I’d keep coming back if I weren’t moving to the mainland! The service is impeccable. Everyone I’ve encountered there is so friendly and professional. They’ve never made me feel uncomfortable or nervous throughout the processes of my laser hair removal. I ALWAYS recommend Honolulu MedSpa to my friends.